In a semi-arid climate where water is scarce, groundwater contamination is a critical problem. To address the issue, researchers are cleaning polluted water with the help of some talented microorganisms and a little bit of sugar. Starting in the early 1960s, the Umatilla Chemical Depot in Eastern Oregon housed a large supply of ammunition and explosives. As part of operations — and before the risks of dumping wastewater into the ground were fully understood — munitions were washed out into a lagoon, inadvertently creating a plume of contaminated groundwater. Groundwater is an important resource in the Umatilla region. It is used for drinking, crop irrigation and commercial needs. In the hydrologic cycle, rainfall can run off into rivers, lakes and eventually the ocean, or it can permeate the soil where it becomes part of a groundwater aquifer. In arid regions like Umatilla, much of the groundwater accumulated in the distant past, when conditions were wetter than they are today. The contamination at the Umatilla site is in a shallow aquifer that could be used in the future for irrigation. However, the objective of U.S. Army Corps of Engineers (USACE) is to clean the contaminated water to a level suitable for drinking water. After identifying the contamination, the USACE initially implemented what clean-up experts call a pump-and-treat approach. In that process, contaminated groundwater is extracted and filtered above ground using activated carbon. The clean water is then reinjected through a series of large, horizontal pipes below the ground, known as an infiltration gallery. The process is slow and expensive, so after a few years of pumping and treating, researchers sought a more efficient approach. To tackle the challenge, Mandy Michalsen, an Oregon State University alumna (’07) and research engineer at the U.S. Army Engineer Research Development Center Environmental Lab, partnered with her former doctoral adviser, Jack Istok, professor of water resources engineering at OSU. They tested an alternative clean-up technology that uses bioremediation — a process employing microorganisms — to break down contaminants. To begin, Istok and Michalsen implemented a process called “the single-well push-pull method,” a technique developed by Istok at Oregon State. It consists of injecting a prepared test solution into a well and then extracting a combined sample of the test solution and groundwater. “Hundreds of industrial sites and national labs — including the Hanford Site in south-central Washington and several military bases in the western U.S. — have now applied the push-pull method,” says Istok, the recognized expert in its application. 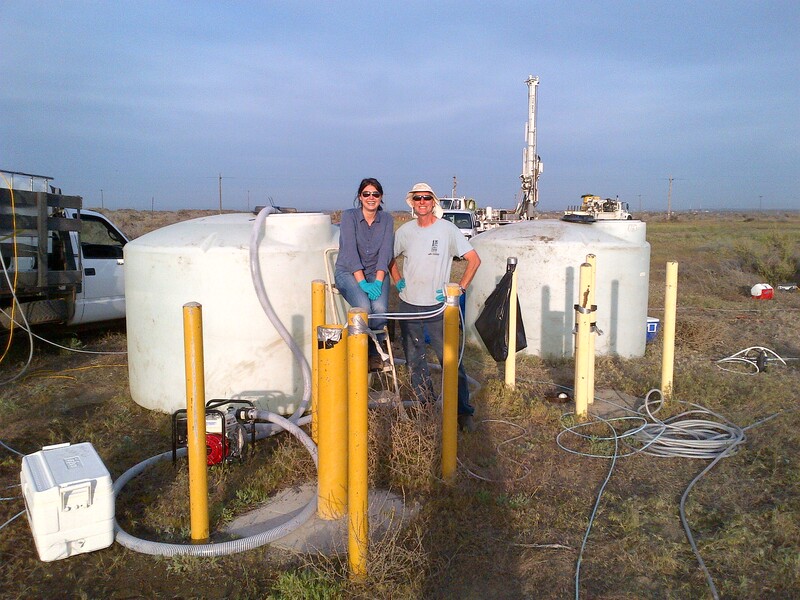 Istok has performed thousands of push-pull tests to detect and quantify a wide variety of biogeochemical reactions occurring in the subsurface and to pilot test larger-scale remedial processes. Within the aquifer, contaminants in the test solution are broken down by a combination of physical, chemical and microbiological reactions. By measuring the concentrations of the dissolved compounds during the extraction phase, the mass of reactant consumed and the product produced, researchers are able to calculate the reaction rates. During their push-pull tests, Istok and Michalsen amended the solution with fructose in a technique known as biostimulation. In short, by feeding microbes, they promoted the development of an anaerobic, or oxygen-free, environment in the aquifer. The addition of a carbon source to the groundwater, where many different types of bacteria are present, led to conditions that are favorable for the growth of other organisms and the rapid degradation of the contaminants. To treat more of the contaminated area, Michalsen and a team from the USACE, Seattle District, and the U.S. Army Engineer Research Development Center introduced large quantities of fructose-amended groundwater throughout the aquifer by using an existing infiltration gallery, which covered the original lagoon. Although it removes contaminants, anaerobic bioremediation has drawbacks, including an unpleasant odor in treated groundwater. To improve their process, Istok and Michalsen teamed with a group of researchers to show how adding a different type of bacteria to the groundwater, a method known as bioaugmenation, could avoid some of the water quality impacts associated with anaerobic treatment. “The special bacteria added can use the contaminants as a nitrogen source for growth under aerobic conditions — using 95 percent less fructose,” adds Michalsen. “Our project is the first one to try this approach on degrading explosives such as TNT and RDX,” says Istok. Now that Michalsen and her team have produced positive lab and field results using the bioaugmentation process and published their results, they are working on additional publications to share their lessons and to support implementation at other sites. “Top scientists and engineers worked with stakeholders — including state and federal regulators who offered valuable technical input — to solve problems and clean up a significant portion of the aquifer,” says Michalsen. Together, Istok, Michalsen and U.S. Army collaborators are producing groundbreaking applied research that will produce clean water for a region that needs it — and ultimately contribute to cleaner water throughout the nation and the world. Note: Johanna Carson is a public information representative in the College of Engineering. Keith Hautala, public information representative in the College of Engineering, contributed to this story.